These obliques exercises are combined with intervals of cardio moves that also target the oblique and abs muscles to help you burn calories while you firm your sides. Do each move for 1 minute; you may not be able to complete a full minute of each component of the program- stop briefly when necessary and return to the move ASAP to finish out the whole minute. Give yourself 10-20 seconds rest between each of the obliques exercises. Make sure and choose a level of difficulty of each movement that you can execute properly (notice the different levels of intensity of any given exercise on the right side of the videos). Complete the entire series at least twice (roughly 20 minutes); for best results from these exercises for love handles, do the entire thing three times through. Note: Obliques exercises alone will not get rid of love handles. An overall reduction in body fat is necessary in order to lose love handles; the cardio intervals in this at home ab routine can help with that, but a change towards healthier eating habits is also a necessity. 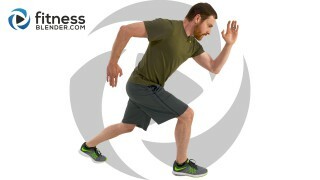 Each time that you run through this at home ab routine, you burn roughly 100 calories (depending on many factors such as your weight, gender, muscle mass and metabolism). Doing the routine 3 times can burn up to 300 calories. Obliques exercises are great for athletes, especially golfers, baseball players and boxers as it builds strength around the twisting of the torso that is so essential to all of those sports. FB Burn Round 2 is here! This 4 Week Program lets YOU choose your workout length & uses a smart combination of strength training, high intensity interval training (HIIT), functional training, Pilates, cardio, stretching and more. 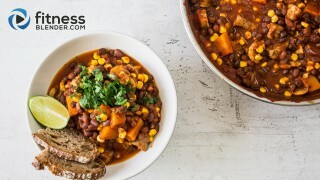 A delicious whole-foods chili recipe that's perfect for cold days and hungry bellies!